The Constellations are an American hip hop/rock band formed in Atlanta, GA. 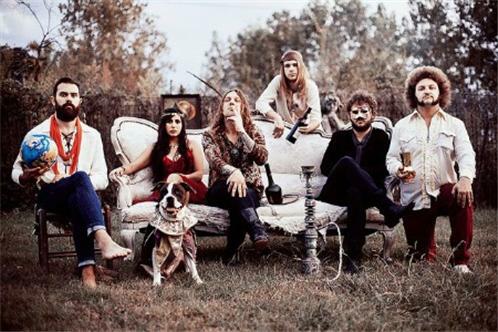 They have a psychedelic soul-rock sound. Forming in Atlanta, the band was signed to a 4-album deal with Virgin Records. Their song Were Here To Save The Day was featured in the NBC season premiere of Chuck on Sept. 20, 2010 and is also included in the soundtrack for the video game NBA 2K11. They have had their songs featured on television shows like USA's " Royal Pains" and " Suits", CW's Vampire Diaries, and Fox's "House." "Perfect Day" was featured during the film Horrible Bosses. Following their 2010 debut Southern Gothic they signed with Santa Monica, CA based 429 Records and released an EP titled 'Sold Out' March 20, 2012 as an appetizer to their second full length album Do It for Free slated for a June 12, 2012 worldwide release. "Right Where I Belong" was chosen as the first single. The band is touring the country in support of the album on Warped Tour.